Raleigh, NC -- This year (2014) marks the PineCone Bluegrass Radio Show's 25th anniversary - the show has been airing weekly on 94.7 WQDR since Jan. 29, 1989. The show’s co-hosts, Larry Nixon and Tim Woodall, started spinning bluegrass on QDR at the station’s request. Raleigh, NC -- PineCone is delighted to welcome The Del McCoury Band back to Raleigh, North Carolina for a night of world-class bluegrass music. Del McCoury has spent more than 50 years as a professional musician, and during that time, he and his band have become the most awarded act in the history of bluegrass. Make plans to see the Del McCoury Band on April 4. Durham, NC - Ten years in the making, Raleigh, NC based bluegrass and Americana group the Kickin Grass Band has made its mark on the roots music scene with strong voices and original songs that reflect the depth and breadth of the human experience. 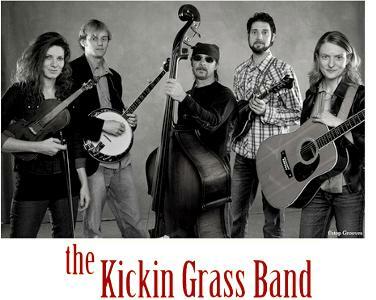 The Kickin Grass Band, celebrates ten years of signature Americana-style bluegrass with a special hometown concert and celebration on Saturday, January 14, 2012 at the Carolina Theatre of Durham. The show is a co-presentation of The Carolina Theatre of Durham and Pinecone – the Piedmont Council of Traditional Music. One of the Triangle's most well-loved bluegrass bands, The Kickin Grass Band, celebrates 10 years of signature Americana-style bluegrass music with a special hometown concert and celebration on Saturday, Jan. 14, 2012 at the Carolina Theatre of Durham. The show is a co-presentation of The Carolina Theatre of Durham and PineCone. Durham, NC -- One of the Triangle's most well-loved bands, The Kickin Grass Band, celebrates ten years of signature Americana-style bluegrass with a special hometown concert and celebration on Saturday, January 14, 2012 at the Carolina Theatre of Durham. The show is a co-presentation of The Carolina Theatre of Durham and Pinecone - the Piedmont Council of Traditional Music. Three of North Carolina's finest traditional performers have combined their considerable talents to create Carolina Lightning. Alice Zincone, Rick Lafleur and Tommy Edwards have performed together frequently for several years under several names, including Tommy Edwards and Friends as well as Carolina Lightning. With the July release of Tommy Edwards' North Carolina: History, Mystery, Lore and More, they settled on the name Carolina Ligthning to emphasize their strong connection to North Carolina and the state's rich heritage of traditional string music. Their Wake Forest performance on Oct. 9 is part of the Town's "Wake Forest Unplugged...Get Connected," which offers community members a rare opportunity to "disconnect" from cell phones, PDAs, and computers, and "re-connect" with their community, friends, and family. Sponsored by the Wake Forest Recreation Advisory Board, "Unplugged" is a full weekend undertaking, beginning on Friday, Oct. 7, at 5 p.m. and culminating with this concert. All of the weekend's events, including the concert, are free and open to the public. Raleigh, NC -- PineCone's 2011-2012 Down Home Concert Series brings roots music of the world to Raleigh's premier performing arts center, the Progress Energy Center for the Performing Arts. Tickets go on sale on August 22; PineCone members can take advantage of a week-long pre-sale beginning on August 15. Bluegrass, Roots, Blues and Americana music will be represented. Join PineCone and the Town of Cary for a special night of music on Friday, July 1 featuring The Shady Grove Band and students from the PineCone Bluegrass Music Camp. The camp included students ages 8-16 learning guitar, fiddle, mandolin and banjo. Charles Pettee of Shady Grove taught the guitar and mandolin tracks, while John Currie instructed the students in the fiddle and banjo tracks. This concert is the culmination of the week-long camp, but may be just the beginning for this next generation of musicians!